RiverCats Softball is designed to introduce and further develop the fundamental skills that are required to play the game of softball. Our program is divided into two levels: Little Cats (JK - third grade) and Big Cats (fourth, fifth, and sixth grade). Each level will provide developmentally appropriate instruction, games, drills, and most importantly FUN. RiverCats is open to girls in JK - 6th grade. RiverCats offers a spring season as well as fall and winter clinics. Instruction will be led by the Collegiate Softball Coaches, Robby Turner (Varsity Head Coach), Laurie Goode (JV Head Coach), and Liz Oduro (JV Assistant Coach), as well as Collegiate varsity/jv softball players. Please contact him at if you have further questions. Robby has been coaching and running camps in the Richmond area for 30 years. He founded the program Sports for Kids in 1989 and brought sports instruction to schools and Country Clubs for 10 years. He has been teaching Kindergarten since 1990 and he has coached three sports a year since arriving at Collegiate in 2000. 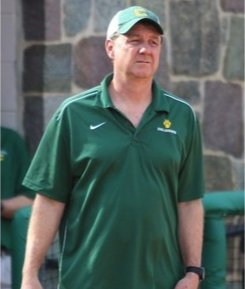 He is the Head Varsity Softball coach at Collegiate School and he created RiverCats in 2012 to teach girls the wonderful game of softball.